Warmzone has been designing snow melting systems for a wide variety of applications for almost two decades. From commercial parking structures and residential driveways to sidewalks, steps and even runaway truck ramps, we’ve provided a radiant heat solution for just about every application imaginable. 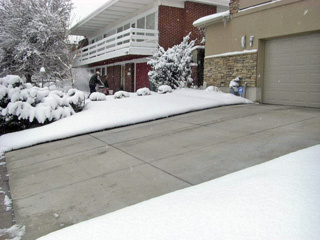 Warmzone customers choose to install snow melting systems for several reasons. Some are for commercial applications and are installed to eliminate the need for manual snow removal as well as to enhance safety for patrons. Being fully automated, radiant snow melting systems provide reliable snow removal, regardless of the hour. This way, customers are assured of having clear walkways to and from the business. Some clients are unable to manually shovel the snow due to physical/medical limitations. Others need to heat their driveway because it is on a steep incline. Doctors and emergency response personnel need to be able to exit driveways quickly, regardless of the weather, and radiant heat has proven to be ideal under those circumstances. And of course, there are some projects that fall into the “luxury” category. Regardless of the customer’s need, each Warmzone snow melting system is customized specifically to best meet the needs of the customer. We do not take a “one size fits all” approach. Every Warmzone system is designed to ASHRAE standards to ensure that customers receive the most effective and efficient snow melting solution for their location, layout, and snow melting needs. Warmzone provides industry leading system design services. Our detailed AutoCAD drawings not only show the layout of the cable and components, but include all the necessary electrical information, such as the proper load calculations, breaker sizes, number of breakers, etc. 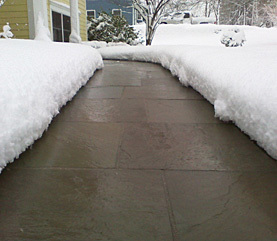 Warmzone snow melting systems feature the industry’s top controls. 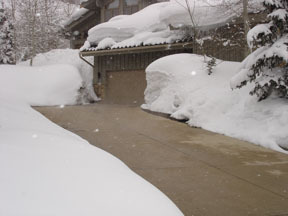 Most driveway heating systems utilize the WS-2C aerial-mount snow sensor (activation device). The unit features an interleaved grid “moisture” sensor at the top and the brass cylinder protruding from the bottom of the unit is the temperature sensor. When the controller detects precipitation and the temperature is below the designated set point, the unit signals the contactor panel and power is sent to the heating cable. The UL listed panels are available with or without GFEP included. (This is an excellent cost – and time – savings option for electricians.) The resistance cable then warms the driveway surface. 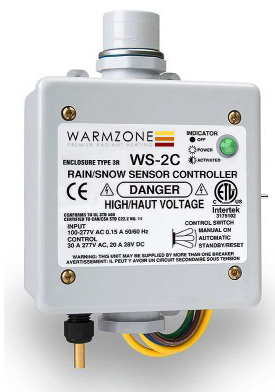 A WS-2C aerial mount snow sensor for automated snow melting systems. The advanced snow sensor is mounted out in the open where it has a clear view of the sky and is exposed to the weather. To ensure that the sensor is able to make accurate temperature readings, make sure it is not mounted near furnace vents, dryer vents or any other source of heat. Because the system has no moving parts it requires no routine maintenance; however, it is recommended that the sensor be powered down and the small sensor grid be wiped clean with clear water once every 4 months. Heat the most trafficked areas – Rather than heating the entire driveway, some owners choose to heat only the areas that receive the most traffic. An 8-foot strip in the middle of the driveway or a 2-foot strip down the middle of a sidewalk may be all that the customer needs/wants. This still allows clear access for vehicles and/or pedestrian traffic, but brings down the installation cost as well as operational costs. Heated tire tracks – Another affordable option (that also requires considerably less power) is to heat two 24-inch wide tire tracks. This is a popular solution for customers with limited power or a limited budget. Not only does this make the installation more affordable, but the layout also demands less power, making it more affordable to run. Heat Specific Areas – Some areas are prone to ice buildup or are on a steep incline. Radiant heat can be installed to keep the incline (or shaded areas) clear of snow and ice to enhance safety as well as convenience. This is especially beneficial for those with driveways that run downhill and into a busy road. Because Warmzone radiant snow melting systems are fully automated, business owners can be assured that parking areas and walkways are kept clear at all times during snowy days. There’s no need to have employees arrive early to shovel or go outside periodically to clear and salt the walks. When a snowstorm hits, the radiant heat system will activate and keep the walks clear. Once the storm abates, the system remains on for a short time to dry the area (to prevent ice buildup) and then shuts off. Because this “after run” feature provides dry, safe walking areas for customers, it greatly reduces the chances of business owners being hit with dreaded personal injury lawsuits. Don’t forget, Warmzone is the innovative leader when it comes to customer service. Installers not only receive a detailed layout with all the technical information, but can talk with a radiant heat expert any time and receive technical support whenever they have a question during the installation. (See Warmzone’s December Newsletter below for more information about Warmzone’s system design services.) Warmzone also hosts a library of helpful installation videos on its website. Check out Warmzone’s Installation Videos here. Warmzone also provides free installation training. Installers receive personal training and can complete the installation course at their own pace. Electrical and design experts are on hand to assist you during the training and/or the installation. Warmzone stands by its customers to ensure that the system is installed correctly and the customer is satisfied. For more information, or a free quote, contact Warmzone today at 888.488.9276. What Makes Warmzone’s Design and Support Services the Industry’s Best? 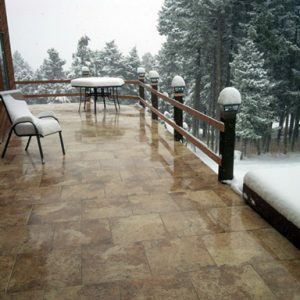 When shopping for a radiant snow melting, floor heating, or roof deicing system, there are several factors to take into consideration to ensure that you install the best system for your needs and that it will perform the way that you want it to. With so many options out there, it can be difficult for homeowners to narrow down the field of potential system providers. 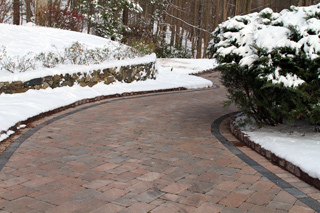 So when it comes to installing a heated driveway or floor, what are the key factors to look for? What factors distinguish one system over another? Certainly you’ll want reputable, proven system components. For a heated driveway / snow melting system this includes the heating element (cable), snow sensor, and the contactor panel or controller. A quality system begins with quality components. This is an area in which Warmzone excels. But a few providers may offer some components of similar quality. So, to further separate the “great” from the “good”, we need to take some other factors into consideration. If you’re sure that you’ve found the highest quality system components, you’ll next need to find out what services are included with those quality components. What role will your provider play in regards to the installation of those top quality components? When it comes to service, too many radiant heat system providers deliver lip service rather than genuine customer service. Few businesses have a trained, dedicated support staff, so installers often end up speaking with sales people or whoever else happens to be free at the time of the call. But radiant heat customers deserve better. Great customer service not only means friendly, technical installation support, but includes accurate system design and layout services. Example of a snow melting system design drawing. It is vital that you have a detailed layout of your system. This not only includes a “road map” of how your heating cable is laid out, but also where and how it is wired to the contactor panel and activation device (snow sensor). The system layout must be created by an experienced designer and electrical expert. Professional system designs should also contain all the technical information for your electrician. Every aspect of the snow melting system should be included so that your electrician and installer know every detail prior to installing any heat cable. Warmzone offers an AutoCAD drawing of the layout with all the technical information necessary to move forward with the installation. System layouts should include proper layout and materials, proper load calculations, breaker sizes, number of breakers, etc. We make sure that your installer and electrician have all the information necessary to begin the install with confidence. And that includes free installation training. Honestly, what makes Warmzone Different? Pre-sales system design – Warmzone provides pre-sales system design services. This is offered to ensure that the system meets all of your requirements. There’s no need to purchase a system and then worry whether it will perform adequately for your specific application and layout. If you choose to move forward with the purchase, Warmzone will include an AutoCAD layout at your request. Free Installation Training – Knowing how vital the proper installation is, Warmzone provides free installation training for installers and electricians. We’ll cover all the aspects of your specific installation, and we’ll be available if you have any questions during the install. This training is invaluable for installers and a great benefit to homeowners. Technical Support – While installing a radiant heating system is relatively easy, and the installation manual covers all aspects of the install, sometimes it still helps to talk with an expert. Warmzone has a dedicated staff of support personnel available to answer your call. If an installer or electrician has questions during the installation, he/she can call and speak with an expert who will work with them to resolve the issue at hand. Commissioning Large Systems for Service – Warmzone support experts are also available to assist customers in the startup and commissioning of large systems for service. For example, for a heated runaway truck ramp in the Northeastern U.S., a Warmzone expert not only provided technical support onsite, but commissioned the system after the installation to ensure optimum performance. Special Equipment – On rare occasions, an installer’s helper may accidentally damage the cable during the installation, but then not mention it so as to avoid repercussions. Then the concrete is poured but the system doesn’t perform as it should. Warmzone has the equipment to locate and repair the cable fault, so there’s no need to tear up a large portion of the driveway. This is a service that few – if any – other providers offer. Warmzone installation experts are available to walk installers through the installation process, and they continue to be available after the system is installed. This ensures that all the customer’s questions are answered and the automated system is ready for the first snowfall. Warmzone focuses on the long term goal of making customers happy rather than just selling snow melting systems. For customers to be satisfied, they need to be treated with respect and work with a friendly support staff that goes the extra mile. With our staff, we can provide consumers with expertise and genuine, personal support services that make them feel more like a partner than a customer. For details about our products and services, contact a friendly professional today at 888.488.9276. Because of the reliability and versatility of radiant heat snow melting systems, these solutions are proving to be popular home improvement and new construction projects. And because radiant heat systems are so easy to customize, homeowners can flex their creative muscles when it comes to installing these systems. 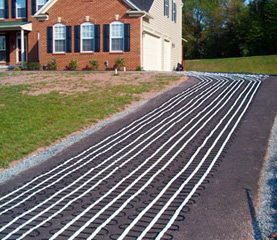 Warmzone radiant heat systems are easily configurable to use in a variety of applications, whether you want to heat an entire driveway, tire tracks, steps, sidewalk or porch, etc. The cables can also be installed under a variety of mediums, such as brick/stone pavers, concrete and asphalt, providing you with endless possibilities when it comes to enhancing your home’s curb appeal. Whatever your goals and budget, you’ll find a range of versatile, affordable radiant snow melting systems flexible enough to conform to your specific needs. One of the most popular, affordable, and easy to install applications for radiant heat is asphalt. Where asphalt gives and flexes according to a wide-range of seasonal temperature changes, the specially designed Warmzone heat cable ensures consistent, effective performance to keep driveways clear of snow and ice in all the conditions. Designed specifically for installation in hot asphalt applications, ClearZone heat cable is rated up to 460 degrees for up to 10 minutes. For additional technical specs and installation information, please refer to the ClearZone installation manual. If you’re seriously considering heating an asphalt driveway or ramp, be sure to take advantage of Warmzone’s unparalleled customer services, including free installation training, installation support, system design and layout, and online installation tips and guides. Heating cables should never touch, cross, overlap or get bunched up. A minimum cable spacing of 2 inches is required. Check the maximum rated heat temperature of the heating cables before you apply hot asphalt. The asphalt must not exceed this temperature. Pouring small quantities of asphalt on the heating cables helps to ensure a safe installation and prevent damage to the cables. Never cut or alter heating cable. To accommodate your layout needs, cut the tape backing of the cable mats, but do not cut the heat cable. Manually lay the asphalt, and be sure to spread it evenly around and over the heating cables. Always handle heating cables with care—especially when using tools such as shovels, rakes and wheel barrels to avoid damaging the cables. When using wheelbarrows, lay down sheets of plywood over the cable to avoid damaging the cable’s outer jacket. Use a Megger to consistently check the cable resistance during installation. 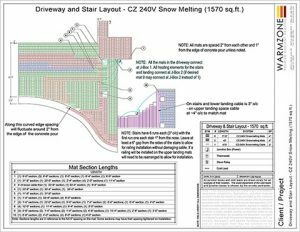 Whether you choose to go with Warmzone radiant snow melting solutions, an understanding of the proper installation, in accordance with your local laws, codes and regulations is important. Call us toll-free at 888-488-9276. Our professionals are available and always happy to answer any questions you may have. Warmzone offers a wealth of information online regarding just about anything and everything radiant heat related. And the best part—it’s all free. While you may be tempted to visit your local hardware store or big box chain for a do-it-yourself kit, it’s important to keep in mind that these one-size-fits-all approaches to radiant heated systems can be risky, particularly if you are tackling a radiant heat project for the first time. Once you choose one of these off-the-shelf solutions, you may be hard pressed to find anyone to answer your questions. What consumers must understand is that a radiant heat system is only as good as its installation. Warmzone offers a large selection of helpful “how to” videos for installing radiant heat. Warmzone has taken the sting (and the stigma) out of home improvement projects with informative, easy-to-follow videos on all things radiant heat related. Warmzone’s comprehensive video library includes time lapse videos and detailed “how to” clips of installations you can watch again and again, any time of the day or night. You’ll also find plenty of tips and tricks from the pros at Warmzone to help make your installation a success. Stuck on a step or concerned about a technical aspect of a project? Warmzone offers more detailed instruction on topics ranging from simple cable placement to cable testing, so you can be assured you’ll have your radiant heat snow melting system up and running in no time. As far as thoughtful extras go, there’s even a video to help you fill out warranty information for your recently purchased Warmzone radiant heat system to help keep you covered. Best of all, you also have access to personal installation support from a Warmzone radiant heat expert. If you’re a hands-on type of learner, you may want to shorten the learning curve with Warmzone’s free webinar training. Warmzone’s valuable online installation training program has helped many contractors and ambitious do-it-yourselfers learn the art of radiant heat installation. Once you call and register, you can login and participate in real-time training to learn how to properly install ClearZone snow melting systems, roof deicing or floor heating systems with confidence. For those in the area, you can attend in person at Warmzone’s headquarters in Salt Lake City. Sometimes all you need is a little time to “hit the books.” In the Warmzone online library you’ll find plenty of detailed information and product literature posted to help you with your studies. Simply click on a link to familiarize yourself with manuals, user guides, installation diagrams and more. In addition to links, Warmzone also offers downloadable versions of these resources for free. All you have to do is ask! If you haven’t purchased a radiant heat system yet, it’s worth the call to Warmzone at 888-488-9276. You can discuss your radiant heat system requirements with a professional who can give you a free schematic, help you select the products for the job or set you up with an experienced contractor in your area to install your radiant heated snow melting system. While Warmzone has established itself as one of the most trusted radiant heating solutions providers in Northern America, its leadership status is not due solely to its line of renowned, proven radiant heat system components. Warmzone distinguishes itself from other providers through its unparalleled customer service offerings. Warmzone was founded on the philosophy of providing customers with the industry’s most advanced, proven products at the lowest prices possible. But quality products alone – even when combined with highly competitive pricing – does not guarantee success, which is why Warmzone structured its business to give customers innovative, superior service. While providing professional AutoCAD layouts showing the precise layout and proper materials, the design also includes all the vital system information such as the correct load calculations, breaker sizes, and number of breakers, etc. 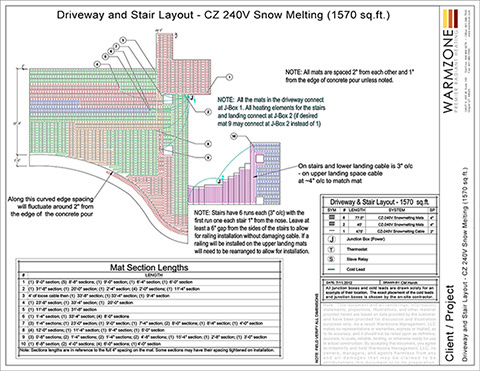 An example of a Warmzone radiant snow melting system AutoCAD layout with specs. By working with Warmzone, I feel like I have the best radiant heat partner working with me, so I never feel alone during the installation process. The designer, engineer and electrician are always there for me if I have any questions or needs. Warmzone was very responsive to our needs, giving us a cost effective and simple solution. I would definitely recommend Warmzone to my friends. My hat goes out to all at Warmzone for your great product and customer service. I feel that your company is one of the best for customer service!!! Thank you Warmzone for the great service. Warmzone consistently leads the pack in terms of providing personal and innovative customer services. Fortunately, Warmzone’s leadership in customer service offerings has forced other radiant heat companies to scramble and improve their services, benefiting radiant heat consumers everywhere. But from its inception, Warmzone has been the clear leader, ranging from its informative website and online documentation and education resources, to premier system design, personal installation support, and free training. Warmzone has proudly raised the customer service bar to benefit all consumers who are considering radiant heat. Among construction professionals, one of the most valued Warmzone services is the free installation training. Installers can attend courses in person or online via WebEx. In many cases, installers can even arrange to have an instructor provide training on location or supervise the installation in person. After successfully finishing the course, installers receive a certificate of completion. Warmzone can then refer future projects to the “certified” installer as other installation opportunities arise in the area. Knowing that the proper installation of a radiant heat system is crucial to its success, Warmzone also offers a comprehensive online resource of “how-to” videos on its website. 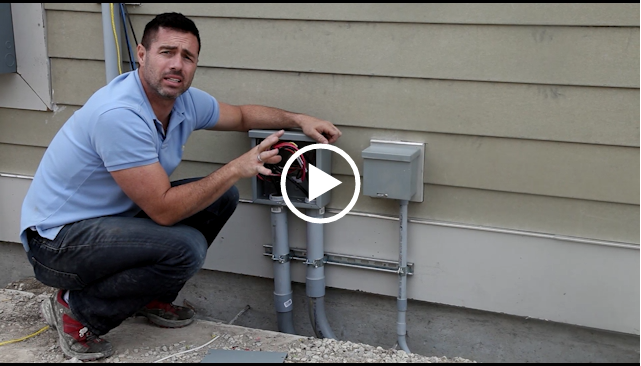 Being able to see the procedures and proper installation techniques in videos has proven to be extremely valuable to contractors and installers. Warmzone strives to make the installation process as seamless as possible for professional builders, and continues to produce informative videos for its popular “Warmzone University” online training and video section. Warmzone’s instructional radiant heat videos include topics ranging from cable spacing to wiring the snow sensor and mounting the control unit housing to the contactor panel. To view some of Warmzone’s “how to” videos, visit Warmzone University. Other helpful resources include Warmzone’s HotNews radiant heat newsletters, product specs, informative articles and product documentation. Tis’ the season for construction and home improvement projects, but finding the right provider and installer for your radiant heat installation can be tricky business. That’s why you should work with experienced pros who emphasize COMPLETE solutions and unparalleled customer services – like Warmzone. So, what’s Warmzone got that the others haven’t? Knowledgeable Experts who Actually Listen. If you’re on the fence about an installation, no worries. Warmzone professionals are always available to answer your questions. If you’re interested in a radiant heat solution, Warmzone can work with you to determine which system and design is best for your specific radiant heat needs. Lots of Choices. Awesome Prices. Warmzone’s selection of radiant heat systems and products represent a wide variety of the best solutions in the industry. Offering more than one brand gives Warmzone the flexibility and freedom to dial in a system that’s just right for your home, and your budget. Inclusive Design Services. All Warmzone custom radiant heat solutions come with a professional system design at no extra cost to you. You’ll know all the technical specs and power requirements before any heat cable is laid out. Warmzone designers are experienced pros when it comes to designing the most effective and energy efficient system possible for each unique installation. This ultimately saves you time and money, and eliminates any costly “surprises” during the installation. A resource of Qualified Installers. No matter what system you purchase, a radiant heat system will only be as good as its installation. Warmzone understands that finding the right installer can be a bit of a crap shoot for homeowners. Despite having the best radiant heat system components, it can all be for naught if your contractor isn’t up to the job. Warmzone can help take the guesswork out of the hiring process. In addition to maintaining relationships with professional installers throughout the country, Warmzone also provides free installation training. This means that Warmzone can recommend contractors in your area who are trained in radiant heat installation. This is just one more service in Warmzone’s long list of comprehensive customer services. Excellent Follow-up. Ever get the feeling that your contractor steps into a project with one foot out the door? At Warmzone, your customer service experience doesn’t end with your purchase. They’ll stay with you throughout the installation process to ensure that your system is installed correctly and performing as it should. Lots of Support. When you call Warmzone the voice at the other end of the phone is an expert in radiant heat solutions who can answer questions regarding your installation. Installation support is included with every system Warmzone sells. With any big home improvement purchase comes some serious homework. If you’re shopping products and/or contractors, add Warmzone to your list of possibilities by simply calling 888.488.9276. When it comes to selection, you’ll find products, products and more products are what makes Warmzone excel in delivering outstanding radiant heat system quality. Unlike many radiant heat providers, Warmzone is not locked into selling customers ONE brand or type of system or heating element. Warmzone offers a wide variety of the industry’s top radiant heat solutions for interior and exterior applications. ComfortTile – Designed specifically for heating ceramic tile floors, this proven industry leader is compatible with all standard sub-flooring materials and can effectively heat virtually all types of floor surfaces. FloorHeat – This thin, low-voltage polymer heating element can be installed directly under laminate and hardwood floors to deliver luxurious warmth without any floor build-up. Heatshield Panels – Insulated aluminum panels that reflect heat with remarkable efficiency to optimize floor heating system performance. In-Slab Heat Cable – Designed for installation in new concrete slab applications to efficiently store and distribute heat. 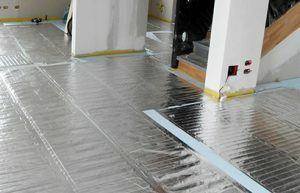 RetroHeat – Allows you to heat existing floors. By accessing the floor joists from below, the thin heating element is stapled up in the floor joist and then insulation is applied to efficiently direct the heat upwards to warm your existing floor. FilmHeat – This paper thin heating element can be cut on site to deliver moderate heat to laminate surfaces without buildup. FoilHeat – Incredibly thin and efficient floor heating mats for use under laminate, wood, glued hardwood and other types of floating floors. Hydronic – Lightweight aluminum Rau panels with flex tubing is the premier hydronic radiant heat solution, and is easy to customize for your specific project needs. To address your needs outside, Warmzone offers industry-leading products designed for concrete, paver, and even hot asphalt installations, as well as the top roof deicing and gutter melt solutions. 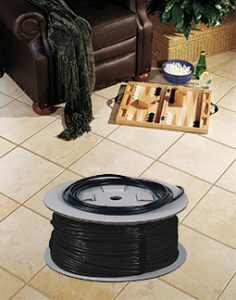 Warmzone snow melting systems are second to none, and you can take your pick from heat cable off the spool or preconfigured in easy-to-install mats. In addition to its embedded snowmelt systems, Warmzone also offers portable snow melting solutions. Regardless of your situation, be it time, budget or application, Warmzone has a product and design to best meet your requirements. For more information on their complete line of radiant heat solutions, call 888.488.9276. With sub-zero temperatures upon us, the last thing most of us want to do is fool around with manual outdoor snow and ice removal. As the temperatures maintain their frosty grip on much of the country, installing a radiant heat solution for your roof, gutters and pipes is a wise, potentially cost-savings move. Featuring a superior outer jacket and carbon core, making installation in frigid conditions possible, Warmzone self-regulating cable truly is the best choice. 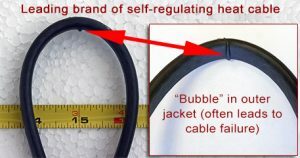 What makes Warmzone’s self-regulating cable unique? The outer jacket of other leading brands of heat cable tends to “bubble” or separate from the cable core when the cable is manipulated for turns. These irregularities create stress points on the cable that allow water to reach the core, causing erratic heating and eventual cable failure. To better illustrate this point, consider the photos shown. At a bend radius of about 2 inches, the outer jacket of other popular heating cables bubbles and pulls away from the core, creating a visible stress point prone to water seepage and eventual failure. 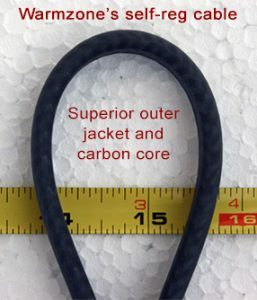 At a bend radius of 1½ inches, the outer jacket of the Warmzone cable is smooth, showing no signs of bubbling. The durable outer jacket is more flexible, so it minimizes “puckering”, even at a tight bend radius. These performance differences are extremely important in applications where tight cable manipulation is critical, including gutters, roofs and pipe tracing. Warmzone self-regulating heat cable can also be installed at much lower temperatures than most, and that’s critical if you’re in a region prone to colder conditions and in need of a solution right now. That’s because the minimum installation temperature for most self-regulating heat cables is 32 – 40°F. At temperatures lower than this, the carbon becomes brittle and prone to breaking when bent or manipulated; and the outer jacket of most competitive cables also tends to stiffen, making it difficult to safely install in cold weather. The high quality carbon center of Warmzone’s self-regulating radiant heating cable is much more resilient, and can withstand installation temperatures as low as 0°F, making them a safe bet for installation in some rather frosty conditions. Factor in the flexibility of the outer jacket in the same weather and you can expect easier installation and more reliable performance. If you’ve decided on Warmzone radiant heating cable, perhaps the hardest sell is finding the right installation team for the job on short notice. Warmzone can help with that too. They’ve forged deep relationships with wholesalers and general contractors across the country to deliver the most advanced, reliable snow melting solutions around, and they’re a great resource for installation support. Just give them a call at 888.488.9276 and discover how Warmzone can keep ice off the roof, out of the gutter and away from your pipes. If you’re one of many savvy business owners intent on growing your business with radiant heat, Warmzone’s design services are an invaluable resource. Each and every radiant heat solution you purchase from Warmzone comes with a professional consultation, including an AutoCAD system design, so you’ll know the exact power requirements and performance expectations for your project prior to installation. These services are second to none in the industry, and are included with your purchase. Overwhelmed by the prospect of tackling something new? Warmzone’s design team can take a lot of the work and headache out of the equation for you so you can competently recommend and deliver the right radiant heat solution for your customers. Our experts free you up to do what you do best, so there’s no need to feel overwhelmed by the prospects of installing a radiant heat system when you work with Warmzone. If you can send us a rough drawing of the project on a piece of paper or describe it over the phone, Warmzone will take care of the details from there. We’ll specify the correct materials, load calculations, breaker sizes, the number of breakers you’ll need, etc. So again, don’t be intimidated by installing radiant heat. Warmzone will take care of the details as well as provide personal installation support. When you partner with Warmzone to install radiant heat, you’re never alone. And our experts are the best in the business. Warmzone has the breadth and depth of products and design services you’ll need to complete your next project quickly, efficiently and within budget, without compromising quality. And you won’t have to go it alone. Warmzone stays with you throughout the installation process to make sure the system is installed correctly and performing as advertised. Your dedicated account manager will follow your project from start to finish to your complete satisfaction. In addition to personal installation support, you also have access to a library of installation resources available at warmzone.com. Warmzone maintains a vast collection of documentation, photos and illustrations that can assist you during your installation or selection process. Deep industry knowledge and design experience informs every radiant heat design Warmzone renders for their customers. Over the years, their design team has developed relationships with experts in cutting edge radiant heat technology, along with plenty of insights they enthusiastically pass on to installers and contractors selecting and installing radiant heat for their customers. Warmzone also offers product and installation training. including certifications provided upon completion of training. If you’re in the area, you can also take advantage of in house training with Warmzone professionals. Whether you’re new to radiant heat technology, or have a specific project you need help with, give Warmzone a call at 888.488.9276. The call is free, the quote is free, and the advice, invaluable! Warmzone has always taken pride in its industry leading products and customer services. And when it comes to providing information on radiant heat, Warmzone very well may offer the single most impressive collection of information on the Internet. With a website that already houses a vast collection of documentation, illustrations, photos, and instructional videos, Warmzone has further bolstered its informational services by offering free, interactive online training sessions. Dubbed “Warmzone University”, the online courses focus on all types of radiant heat system installations. Whether you are looking to install a heated tile floor, a roof deicing system, or a heated driveway, these instructional courses cover it all. Warmzone is also registered as an AIA CES approved provider, so in addition to the various installation courses, a course is also offered for contractors to meet their continuing education requirements. Warmzone reports the credits earned by attendees to the AIA CES, and attendees also receive a Certificate of Completion for the AIA. Warmzone is also working on a comprehensive “How to” section to add to its website. The section will address the top issues based on the most common questions received by Warmzone’s installation support staff – on all types of radiant heat installations. The information will be posted for homeowners and installers to freely access to learn more about the how’s and why’s of radiant heat installations. With one of the largest selections of electric radiant heat solutions in the business, Warmzone will custom design a system to meet or even exceed your expectations – and your budget. Their professionals will step up from your initial inquiry to offer solid solutions to your heating requirements, regardless of the size or shape of your driveway, free of charge. 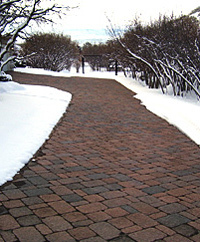 You have several options to choose from when it comes to heating your driveway. You can install snow melting cable under the entire area of your driveway or install heat cable only in the most trafficked area. This usually involves the installation of an 8-10 foot strip up the middle of your driveway. Another economical alternative involves installing heat cable in two 24-inch wide tire tracks. You can save even more money by doing much of the installation yourself. The cable is relatively easy to install, but it is important that a qualified electrician perform all the wiring. An extensive library of free articles, manuals and installation information is also available on Warmzone.com. Summer is the perfect time for outdoor home improvement projects. Find out if there’s a Warmzone ClearZone heated driveway in your future by calling 888.488.9276 today. As one of the most trusted providers of radiant heat solutions, it’s no surprise that Warmzone has established itself as a leader due to its outstanding customer service. For contractors and homeowners alike, Warmzone has proven to be the ideal partner when it comes to installing radiant heating systems – for both indoor and outdoor applications. From complete system design services to personal installation support and free training, Warmzone is focused on meeting all the needs of its customers. It’s nice to know there are still companies out there like Warmzone. These guys care about getting the job done right. Thanks to them, my wife is happy and we’re thrilled with the warm floors. Perhaps the best part of all this is that I was able to stay within budget on this project. Thank you Warmzone. I would like to express my gratitude towards your organization. I was doing a kitchen floor remodel and living room floor remodel. My wife and I decided to pull up carpet in the living room and tile the kitchen. I decided that from talking to others who have done the same, that they experienced cold floors in the winter months. I decided to research “Radiant heat“. I was at our local Home Depot store and they were all set in selling me their product. I decided to research out electric radiant floor heating on the internet. Thanks to the Internet I found places that gave me a lot of info. However, as I filled out your questionnaire at “Warmzone” I was pleasantly surprised at the response I got from Matt. He was extremely pleasant to deal with was extremely knowledgeable of your product, and if he did not know the answer he said so and got the answer I needed. After the purchase of your products (HeatShield aluminum panel and ComfortTile heat cable for under tiles), I started my homeowner installation. I am very handy with my construction abilities. However, I never put in a radiant heat system. In short Matt was able to answer any questions I had come up with (and they were numerous) and keep me rolling along. Not only was Matt very helpful and knowledgeable about the installation but when I had electrical question about the programmable thermostat, Matt had hooked me up with Dan. Dan effortlessly had me program my thermostat and was working like a charm. My hat goes out to all at Warmzone for your great product and customer service. I feel that your company is one of the best for customer service!!! Thank you Warmzone for the great service. Call Warmzone at 888.488.9276 for more information and project consulting, all free of charge, of course!